VADODARA: Labourers working in a field on Ajwa-Nimeta Road were in for a shock when they were harvesting crop on Monday afternoon. They spotted a six-foot-long crocodile resting amid the grass in Champalipura village. Locals immediately informed forest officials who rushed to the spot along with animal activists. This is the second time within three days that a crocodile has been rescued near Ajwa Lake. “We got a call at about 3 pm following which we reached at the spot. The crocodile was rescued and handed over to the reptile to the forest officials. It will be released by them on Tuesday,” animal activist Rakesh Vadhwana told TOI. He added that the crocodile may have come out of the Narmada canal nearby. On Saturday, a fully-grown crocodile 14-foot- long crocodile had strayed out of the lake and was trying to cross the road when some passers-by saw it and informed the forest officials. Vadhwana said that the reptiles usually stray out of their abode in search for another water body or food. 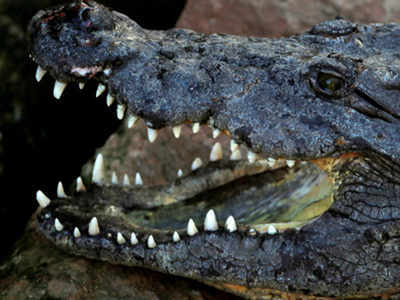 “The crocodile was carrying a tag which means it was rescued earlier too,” Vadhwana said.